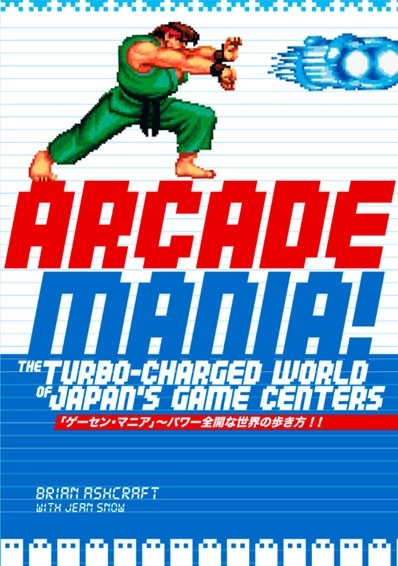 So there you have it, the cover to Arcade Mania: The Turbo-Charged World of Japan’s Game Centers. That is indeed the book I’ve been working on since last fall, and it’s finally time to start revealing details. First of all, you’ll notice that Brian Ashcraft — the man without whom there’s no way in hell any of this would ever have gotten done — gets the main credit on the book, and there’s a good reason for that. Over the course of the project, Brian took a big lead on things, in terms of both direction and writing. 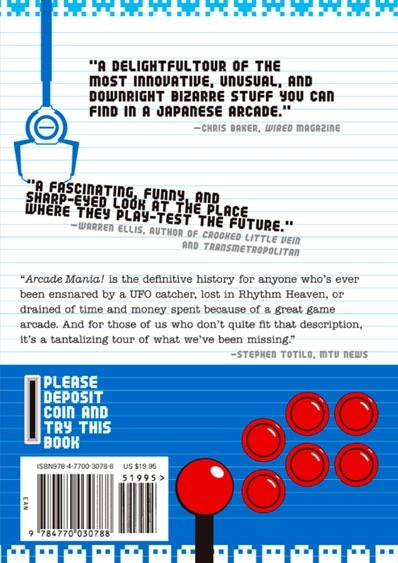 Arcade Mania is as good as it is — and I really think it’s good — because of Brian’s incredible dedication and killer instincts, and I thank him for taking on the hard — and stressful — job of putting all the pieces together, which he has done in a brilliant way. Huge thanks also go out to our tireless editor at Kodansha International, Cathy Layne, for putting up with us, Yuki Nakano, for the amazing photography you’ll find within, and Andrew Lee for the outstanding art direction. So what exactly is this book about? Brian just put up a great post over at Kotaku which I think describes it in the best way possible, so go there for more details. We will be launching a website for the book which will include more details. It should be up sometime in September. There’s also a Facebook group, which I invite you to join. It already features plenty of photos that Yuki took over the course of the project. When and where can you pick up the damn thing? It officially comes out September 24 in Japan, although I’m told it should be hitting shelves a few weeks before that. The North American release is set for January 2009. You can already pre-order the book on both Amazon Japan and Amazon US. I notice that the Amazon Japan listing includes the US release date, but I’m assuming it will become available in September. Below, a look at the back cover. Big thanks also to Warren Ellis, Wired‘s Chris Baker, and MTV‘s Stephen Totilo for the lovely quotes.